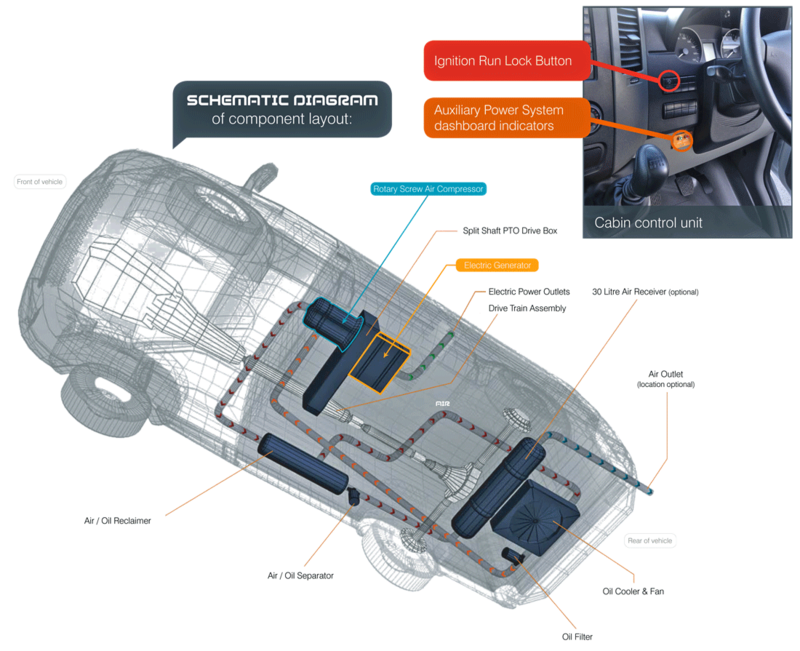 This latest technology in vehicle compressed air systems is in use and has been proven by leading utility companies and civil engineering contractors throughout Europe. This system is ideal wherever mobile compressed air is needed. Also available as a combo unit including a generator for reliable, high quality mobile power. If you’re needing access to compressed air on your machinery we have you covered there too – check out our Hydraulically Driven Compressor range for the latest air power innovations. The Turret Onboard Energy Power Conversion kits (TPS75 / TPS95) are very versatile and can be fitted to most modern rear wheel drive vans and light trucks. The system uses a split shaft PTO drive unit that diverts the power from the vehicle’s rear driving wheels to the auxiliary power unit. Due to the high power being delivered through the driveshaft this in turn produces high capacity compressed air and electrical power supply – more than sufficient to run your full range of tools and equipment. Engine mounted kits available to suit front wheel drive and other configurations. View the brochure for more details. We also have your machinery fleet covered with a range of Hydraulically driven compressors to provide a ‘plug-in’ air supply where it’s most convenient.